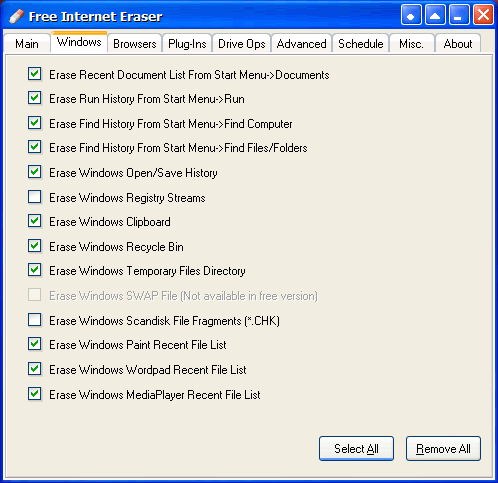 Free Internet Eraser is a free privacy program that can delete files permanently from your hard drive. If you want to prevent people from seeing what you’ve been searching for on the Web, this is one of the best programs you can use. It completely deletes your Internet Explorer and MSN Explorer history, your address bar history, cached web pages, cookies, typed URLs and downloaded program files. It also deletes other data in Windows, such as the Recent Documents list, the Run history, the Open and Save history, the Clipboard, the Recycle Bin and more. 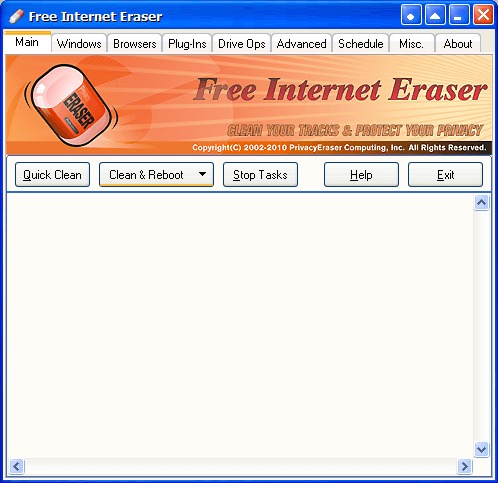 Free Internet Eraser is a very lightweight application that works in Windows 98 through Windows 7, including both the 32 bit and 64 bit versions. You can download the software on CNET’s Download.com. It’s a good idea to back up your registry before using Free Internet Eraser. To do this in Windows Vista and 7, click the Start Search box (click Start and Run in Windows XP) and type regedit, then start Regedit.exe. 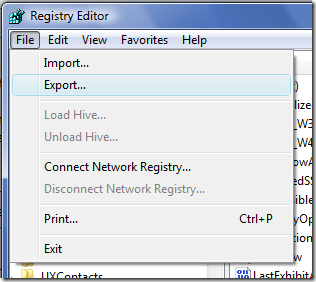 Click File and Export, then save your registry file. If the file deletion causes problems, you can import the registry file later on. Open Free Internet Eraser, then click the Browser tab. Select the files to permanently delete. 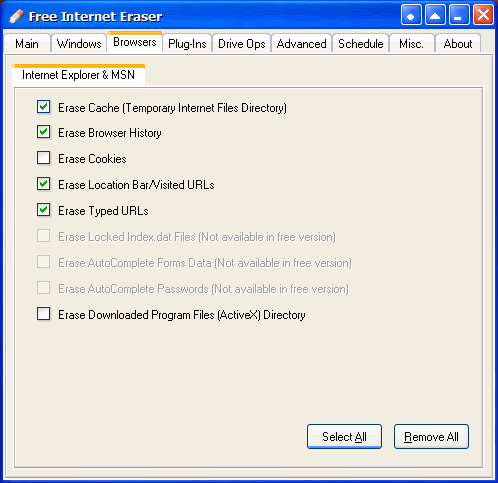 Erase Cache will delete all the file in your Temporary Internet Files folder. Erase Browser History will remove the browsing history that appears when you click the yellow star in Internet Explorer. However, to delete your browsing history completely, you must also choose to erase the location bar and erase typed URLs. While this will protect your privacy, it may also slow down your browsing, since the sites you’ve visited will no longer be available. To compensate, create a favorites list of the websites you tend to visit most often. 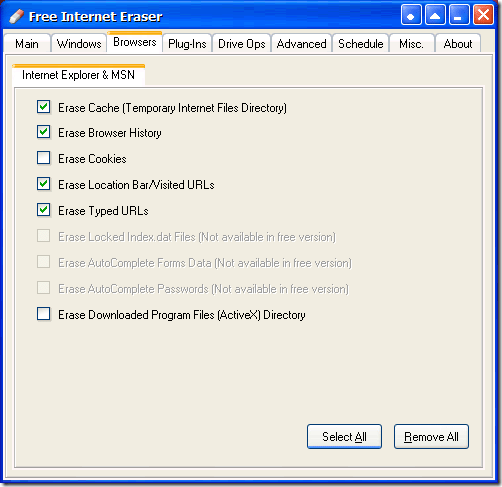 Selecting Erase Cookies every now and then is also important for protecting your privacy. It’s especially important to delete the cookies created when you log into online banking or PayPal. But if you’re logged into any websites, deleting your cookies will log you out of all of your accounts. You will have to manually log back in those accounts you’d like to use regularly. Erase Downloaded Program Files will delete the ActiveX files you’ve downloaded. Click the Windows tab. Select the Windows files you wish to delete. Most of the options in the tab are safe to delete. The top four options delete your history from the Windows Start Menu. The Erase Windows Open/Save History option deletes the history of the files you’ve opened and saved. The Erase Windows Clipboard, Erase Windows Recycle Bin and Erase Windows Temporary Files Directory typically delete files you no longer need. Don’t try to delete these files when you’ve working copied data or while you’re installing or uninstalling programs. Also check the Recycle Bin to make sure that you didn’t delete any files by mistake. 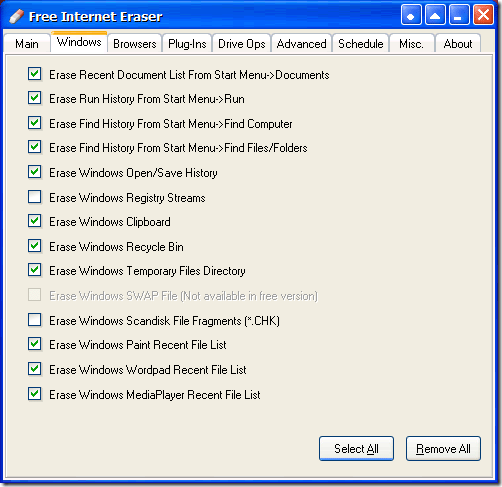 Erase Registry Streams deletes the history of your Windows Explorer settings. The last three options delete recent file lists for frequently used Windows programs. Click the Main tab. If you plan to keep working on your computer, select the Quick Clean option. Otherwise, you can select Clean & Reboot or Clean & Shut Down from the Clean & Reboot drop down menu. 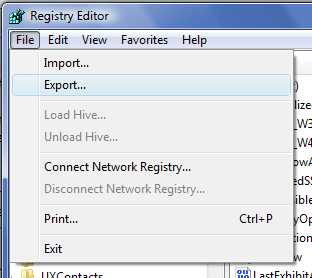 If you would like to automate the file deletion, click the Schedule tab and click the box next to Schedule Options. 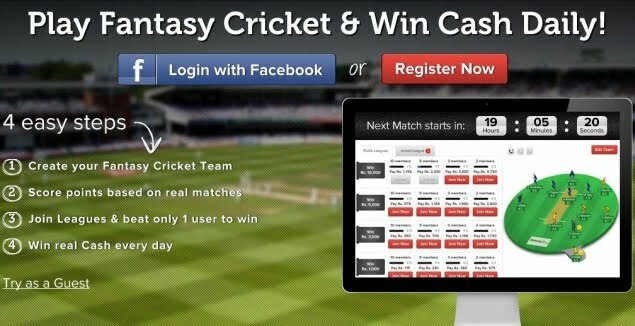 Choose a schedule interval, start date and start time that’s convenient for you, then click Apply.